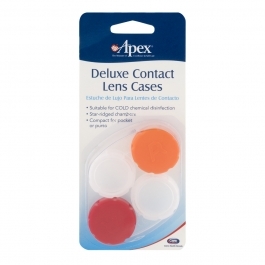 Before using the Deluxe Contact Lens Case for the first time, clean and wash the case and caps with hot water only. Do not use any soaps, detergents, or other household chemicals. Rinse thoroughly with sterile saline or sterile disinfection solution. Use this method to clean lens case weekly. For Cold Chemical Disinfection: Follow lens care procedures recommended by your eye care professional.